Mike, Summer and Mike are joined in studio by CA Sizemore, and Chris Lester of Metamor City Podcast. Chris tells us all about his podcast, and of finishing up volume one, and preparing for the next volume. Voicemail: Arkle wants to know more about Second Life. He's been avoiding it, and is one of many who's under the mistaken impression that Second Life is a video game... it's not a gaming environment like EverQuest and World of Warcraft!! Think of it as another place to build a community where word of mouth about your art or product can and will spread. 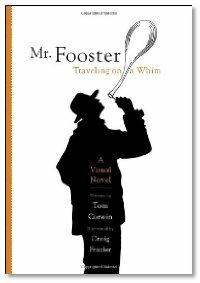 Interview: Mike, Summer and Mike talk with the author and illustrator of Mr Fooster, Traveling on a Whim, Tom Corwin and Craig Frazier. Tom and Craig tell us of how they met, and how they began collaborating, and how the inspiration for the actual story was one of Craig's existing illustrations. We also talk about the back and forth of the collaborative process, and bringing the words and the style of the art together, and growing the project into the finished version. 1: I can understand why you made that gaff, but I do know that SL isn't a video game. I was just using my getting rid of games as an example of things I've done to help my time issues. 2: I appreciate all the advice, and I was intrigued by all the points made, especially by Stackpole. However, one concern that was not addressed was the issue of the bugs. I know you guys heard that part cause you laughed at my Outbreak reference. I've gotten it cleaned up enough that it doesn't crash constantly, and most sites don't take forever to load, but I'm still concerned that SL would do to my PC what the Cylons did to the Colonials in the Miniseries. Well, looks like my concerns weren't unfounded. Tried to install. It won't work cause I have an "outdated video card."